On our 2nd day in Barcelona, we designated that one special day to explore Gaudi’s masterpieces: Sagrada Familia and Parc Guell. 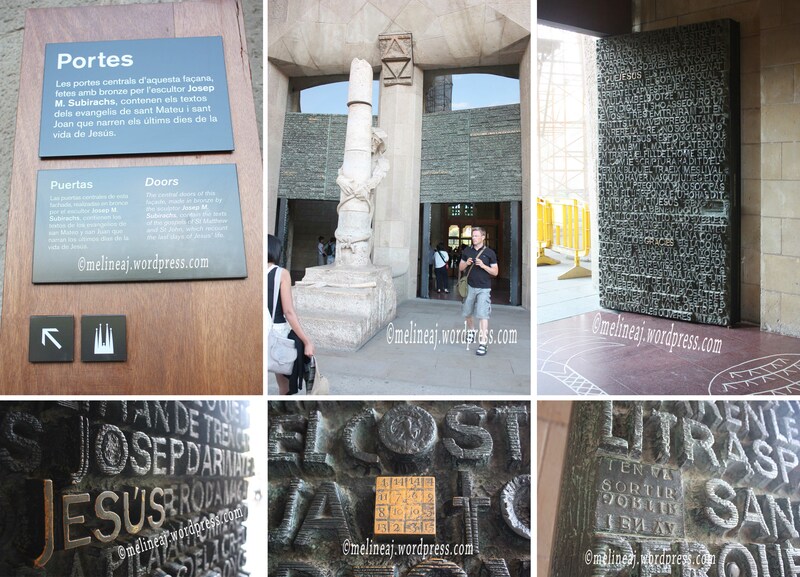 I told my husband that the line up for Sagrada Familia is usually super long according to many websites. Since, we didn’t have lots of time in Barcelona, we decided to book Sagrada Familia tickets the day before via its website. We chose to buy Basilica & Torres/Tower ticket that costs € 19.30/ person. It is more expensive than if you buy the ticket onsite, but it’ll save you time for line up. When buying the ticket online, first you are required to choose which tower you’d like to go (Passió/ Passion or Naixement/ Nativity). After choosing the tower, you need to choose the time you’ll visit the tower: matí/ morning, migdia/ afternoon, or tarda/ evening. Once you select the time, the website will require you to choose the exact time to access the tower. Apparently, they have a quota on how many people can be at the top of the tower at once. We bought the ticket with the access to Nativity tower at 10 am. When we got off at Sagrada Familia metro, we saw the line up was 1.5 blocks away (probably about 1-2 hours)!! Pfiuhhh… we felt so lucky! Remember, the line up is for those who want to buy the ticket on the spot. Since we already purchased the ticket and had the confirmation email, we walked straight to the entrance. We were in front of the gate at about 9.30 am and immediately stood in a short line to enter a special gate to redeem our ticket. There was a guard checking the confirmation email and he said that we couldn’t stand in line since we were 30 minutes too early!!!! WTH?!!!! We purposely got there earlier so we could have enough time to explore the church before going up to the tower! I was a bit angry as well as a group of American tourists who was in front of us. Anyway, we waited for 5 minutes outside the line and got back to the line as soon as the guard left. When we were at the ticket booth, the lady there didn’t have any problem redeeming our ticket. However, DO CHECK your ticket!!!! We booked the Nativity tower, but the lady at the ticket booth gave us Passion tower!!!! And we only realized it prior going up to the tower! Sucky…. Nativity tower is accessed by elevator going up but for going down, you must take the stairs. The Passion tower has an elevator to go up and down. However, many reviews suggested the Nativity tower since you can actually see the sculpture of Nativity fascade in front of church. So, in choosing which tower to visit considers how fit you are. Passing the ticket booth, we entered church front yard where there was a small miniature model of the church. Next, we entered the church via Passion tower. But wait…. I just had to admire the doors!!!! The doors on this side contain the text of gospels from Matthew and John narrating the last day of Jesus’ life. The interesting thing is the gold painted 4×4 box containing numbers. Later, we found out from the museum downstairs that if we add up the numbers in certain way, the total is 33, Jesus’ age when he died. Once we entered the church, we were speechless! The sun light passed through the colourful stained glass along the church gleamed beautifully! The ceiling of the church was EXQUISITE! It was definitely different than any other churches but in a good way! The design was so unique, it seemed like we were under big tall trees in white forest! Every corner of the church was crafted meticulously with elegance yet it was eccentric. The tall marble columns have certain patterns on them – which later we found out that it was inspired by real tree in forest. The spiral stair leading to the 2nd level balcony was curved like a dancing ribbon; while another stair was designed to look like carved bones. We also noticed that on each round window, it has different named imprinted on it – not sure whose names they are. Around each bulb, the wall was designed as if it was a sun with protruding rays around the bulb. On contrast, the altar of the church was pretty simple. It has a cross with Jesus statue hanging on top of an altar table and surrounded by small lights. I guess this simple design balances out the quirkiness of the church interiors. The main door – the one leading to the altar in the future – was actually not finished yet. They hang a big print out of the future main door at the opposite side of the altar. The design of the main door is similar to the ones at Passion fascade with words on them. 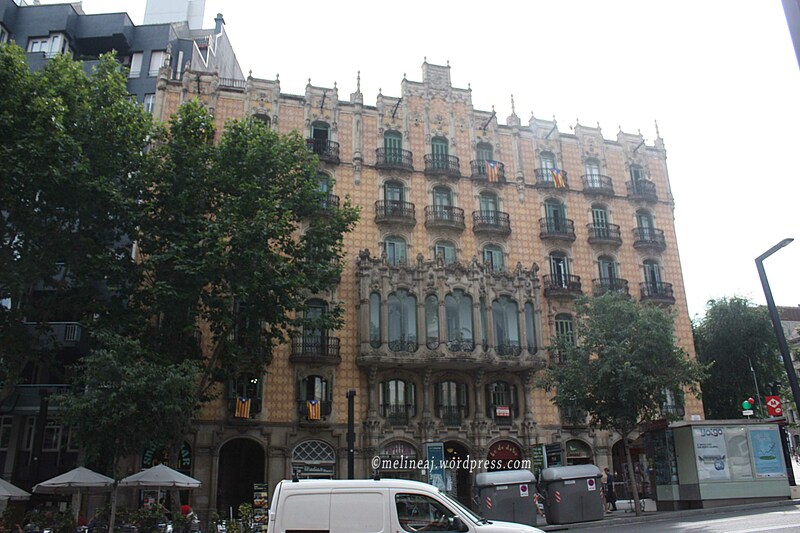 Near the Passion fascade, there was a house with wavy roof where Gaudi lived during the construction of the church. 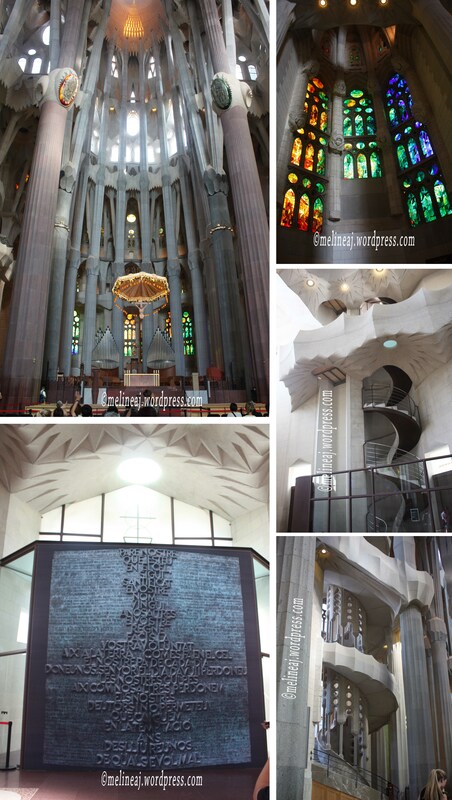 The stunning interior of Sagrada Familia! As I mentioned earlier, we booked the ticket with the access to Nativity tower. However, when we claimed our ticket, the lady gave us Passion tower ticket. We didn’t realized this until we went to the Nativity tower and the guard told us to go to another tower. We then said that we originally booked the Nativity and if we could possibly climb up to the Nativity tower instead. We were asked to wait for about 10 minutes while the guard tried to contact someone. I was kinda angry and told my husband that we should just go to Passion tower instead since I didn’t want to waste too much time. So, we went up the Passion tower using the elevator after waiting for about 15 minutes in the short line. When we were up at the tower, it was cramped. The moment we stepped out from the elevator, we went up small stairs to a small bridges with a peek of Barcelona view. We then walked up a narrow steep staircase leading to a small opening where we could see some constructions going on at the church. Climbing down a small stair, we ended back to the elevator. It was actually just a 5 minutes circle walk but we didn’t even feel like we went back down to where the elevator was (since the steep staircase felt like we climbed higher). But that’s the BEAUTY! The design was supposed to TRICK us as if we were on higher level and yet, it was actually just a circular path! CLEVER!!!! 😀 We spent a good 15-20 minutes at the tower and went down via the elevator. 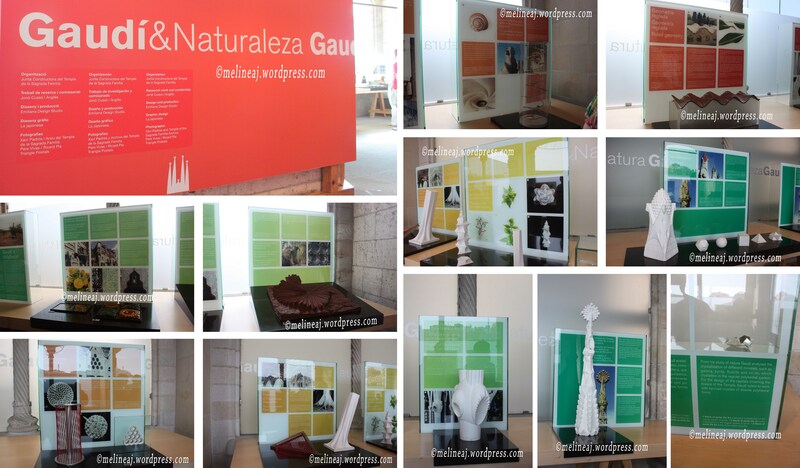 Afterward, we went to a small museum about Gaudi & Nature. I think this was the most informative and inspiring part of the tour. 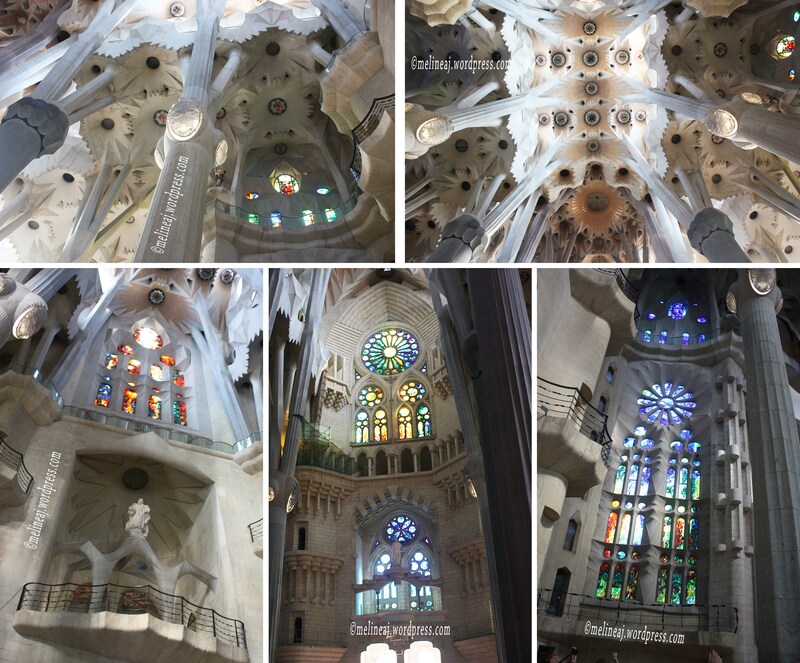 It shows you where Gaudi got his inspiration from. Gaudi could turn simple things, such as wood log, leaves on tress, spiral shaped shell, even the bee nest, into amazing building blocks of Sagrada Familia. It was really an eye-opening for me! Next, we went down to the lower level of the church. 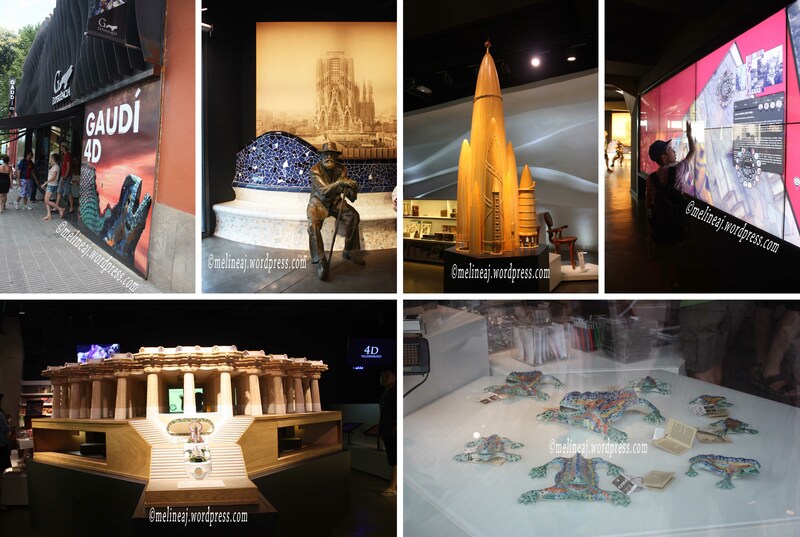 Here, they have a little museum displaying the design evolution of the church as well as models of the church designs. 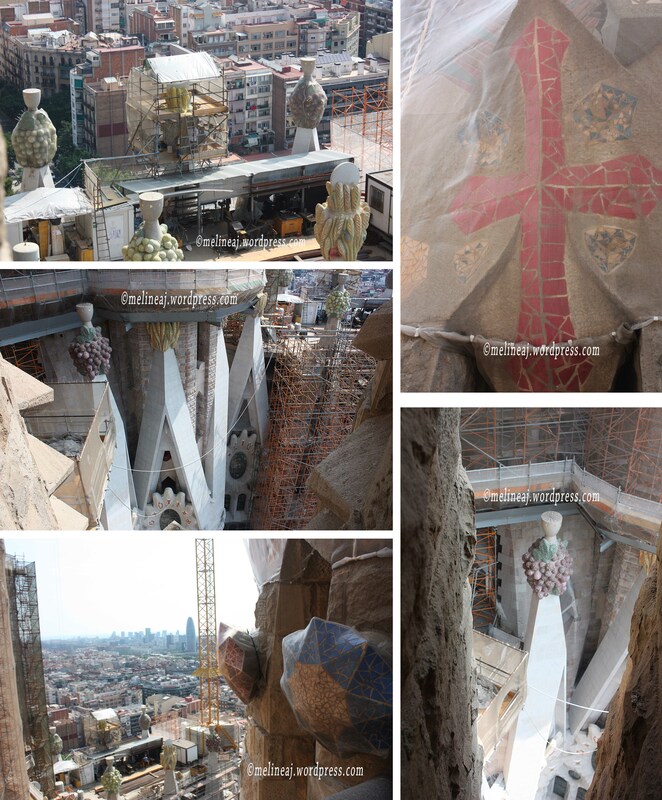 It also has an auditorium where people can sit and watch how Sagrada Familia is built from 1889 to its recent development. Can you believe that the whole church will be finished in 2030!!! Yes… it’ll be 141 years to build just ONE church! Sadly, it was almost 1 o’clock in the afternoon and we had to leave the mighty Sagrada Familia since we had a lunch reservation at Alkimia restaurant at 1.30 pm. Since my hubby was too hungry to walk to the restaurant, we had a quick bite at the nearest KFC across Sagrada Familia. The restaurant was only 3 blocks away from the church and we arrived a bit early. Alkimia, a Michelin stared restaurant, is well known for its gastronomic cuisine. We got there 10 minutes early and the restaurant still closed. So, we walked around but not much we could see. Apparently, they were pretty strict on their opening time. At 1.30 pm sharp, the door opened and we were allowed to enter the restaurant. Luckily, we had reservation because by the time we ate there, the restaurant was all booked and all the tables were filled! Next, the server brought the first appetizer: poached egg with some sort of sauce and bacon bits, topped with spinach drizzled with sweet vinaigrette. The bacon bits were the highlight here! As anyone said, bacon makes everything taste good! And the creamy sauce was good too! The 2nd appetizer was cold tomato soup. The servers poured the soup as soon as they put the plates on our table. The presentation was beautiful! The big chunks of tomato were hidden under pile of thinly shaved fried onion (?) and it had slivers of white almonds (?) around – sorry I forgot what the ingredient of the soup. But for sure, the cold soup was delicious! The creamy with a hint of sourness of the soup awoke our taste buds for the main course. As soon as we finished the cold soup, the server promptly cleaned the table and brought our main course. Although the presentations were simpler than the appetizers, the taste was as good as any other meal. My hubby’s meal – two beef slices topped with steamed vegetables with separate sauce on the side – was served on a rectangle white plate. My main course was 2 pieces of cod with some vegetables and 2 kinds of sauce. It was goooodd! We ate the main course slowly since we wanted to savour the dish hahahah…. After the main course, dessert was brought out. It was eucalyptus panna cotta with wild strawberries and honey drizzle. Honestly, the cream tasted kinda weird. When I researched about it, I found out that the taste was from eucalyptus. We thought we were finished but then the server asked what kind of coffee we wanted. Since I’m not a coffee drinker, I ordered the same one as my hubby, espresso. The coffee was strong! And it was served with 2 little pieces of sweet bread. By that time, I was stuffed so I let my hubby finished my coffee. When we asked for the bill, the server brought us a bowl with 2 pieces of white chocolate on top of real coffee beans. Overall, our experience dining at Alkimia was good. I had high hopes for Michelin stared restaurant. Not that Alkimia didn’t deliver, I just think it missed something that could make the dining experience more memorable. Our next destination was Parc Guell. From Alkimia, we walked north and took a random bus as my hubby suggested. He was pretty sure that he could find the way to the park using the map on his cellphone. We stood near the door in case we needed to get off quick. An older lady seemed to notice that we wanted to go to Parc Guell and she started trying to give direction in Spanish. I think she told us that we got in to the wrong bus. Err…. I looked at my hubby confusedly… We just smiled to the lady as if we understood what she was saying heheheh… Then, I saw that bus #24 was just behind our bus, so we stopped and changed the bus. Only this bus will take you to the top east entrance (Parc del Carmel) where you can climb down toward the main entrance. Another way to reach Parc Guell was by walking 15 minutes up the hill from Lesseps metro station that leads you to the main entrance of the park. There are other buses from different locations in Barcelona that will take you to Parc Guell. Tripadvisor has a good summary for available buses. The MAIN entrance is the one with the iconic colourful salamander statue at the front. So, don’t be disappointed when you get off at Parc del Carmel and only see the ‘caves’ from brown rocks. The bus driver didn’t really announce when the bus stopped at Parc del Carmel, but we just followed everybody who got off once the bus stopped at the parking lot. At the entrance, we saw the map of the park. This seventeen hectares park is MASSIVE! 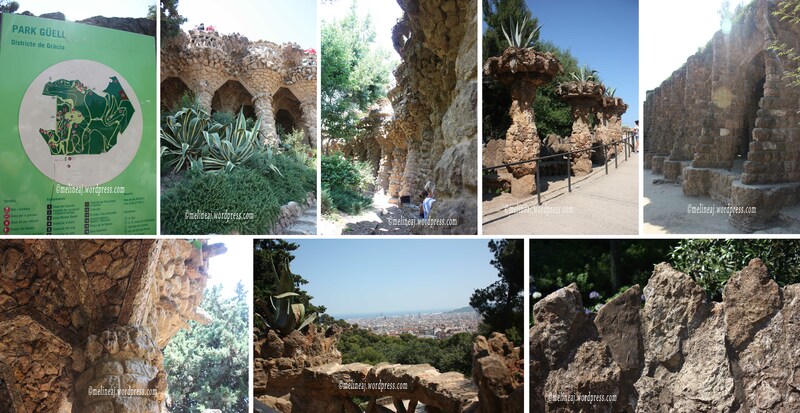 Gaudi designed this man-made park to resemble nature with rock caves formation. I saw that some of rocks that made up the columns were sticking out as if they were in nature. Yet, the unique Gaudi’s design was visible everywhere. From the balcony railing made of rocks and rock formed like trees to the beautiful combination of flowers and dessert plants. It was meticulously planned. 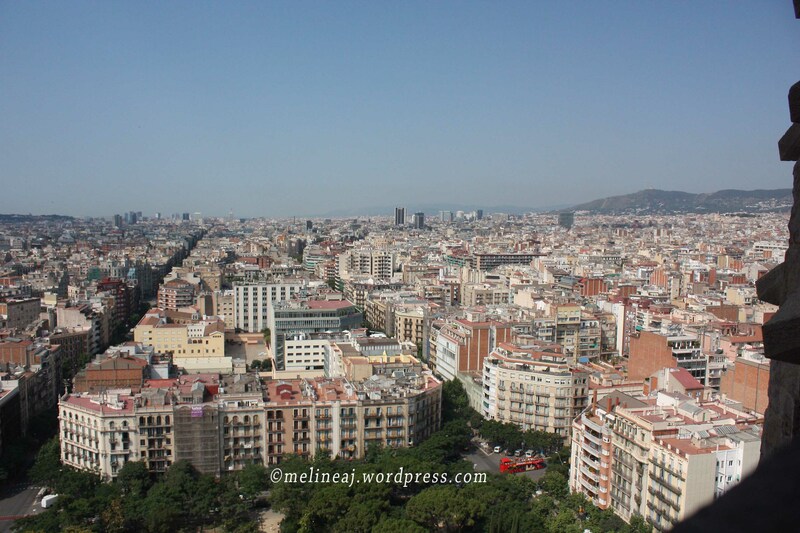 When we were at the upper part of the park, we could see the beautiful Barcelona from the spot. As we walked down, I noticed that there were actually geckos on this park! Since the rocks are brownish coloured, it was the perfect camouflage for the geckos. Prior approaching the famous serpentine bench, we passed by Casa Museu Gaudi. This bright coral building was the actual residence of Antoni Gaudi for 20 years before he moved to Sagrada Familia to start the construction there (ref). Compared to other complex houses designed by Gaudi, this house is fairly simpler; yet, the details, such as the windows and the window panes still showed Gaudi’s signature all over them. The entrance ticket to the museum is €5.50. We didn’t visit the museum since I was rushed to see the pretty mosaic bench. We then walked down the path toward the serpentine bench – the famous mosaic bench. This huge space gives a great view of Barcelona with the blue sky above. The middle part of the bench was the most crowded area among tourists since that’s the only spot where we could take great picture of the bench with Barcelona at the background. Also, you can see two small ‘ginger-bread’ houses at the front entrance from here – yeah… they were super cute & resembling gingerbread houses! 😛 We took advantage of other tourists by asking them to take picture of me & my hubby and we, in turn, took a picture of them. Since I really really wanted to take a picture of me alone at that spot, we waited patiently until all the tourists moved to another spot and yes, I got my best picture 🙂 We then moved to a farther side of the bench and sat to enjoy the beautiful scenery. 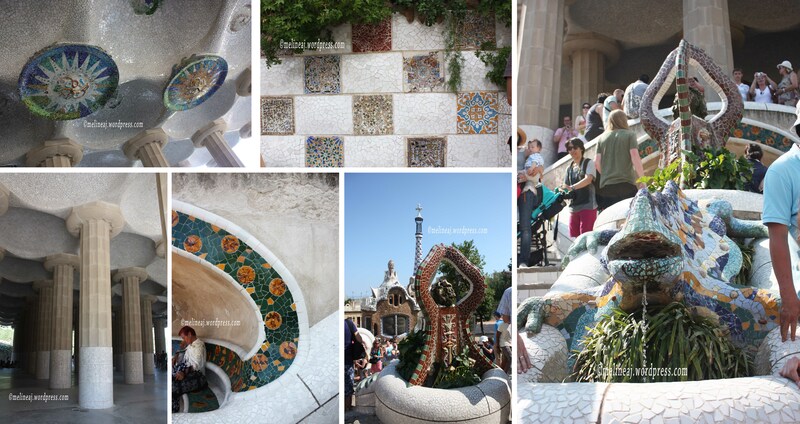 I still can’t imagine how Gaudi could create a great technique to compose the beautiful mosaic art from broken ceramics (the technique is actually called trecandís)! It was just super neat! When we finished absorbing all the beauty of the mosaic – well… I did 😛 – we went down to an enclosed space that is actually under the protruding serpentine bench. The grey cement floor may seem unattractive, but wait… look UP! The ceiling looked like glitter reflecting sun light! The two circular colorful mosaics on the ceiling were the outstanding among the gloomy space. Climbing down the stairs, we saw lots of people crowding the iconic salamander statue to take pictures. Some people were really courteous and patiently waited their turns; while others were rude and shooed us away! Actually, there are 3 fountains at the center of the staircase. The first one at the very top is a brownish conical shaped tower. The middle fountain is the iconic colorful salamander/dragon/ lizard. The bottom fountain nearest to the main entrance is a white-blue circle with an animal head sticking out of the wall. Before taking picture of the fountains, don’t forget to visit a small cave with beautiful trimming of golden marigolds on green mosaic ceramics. It was a good spot as resting area too. Near the front gate, there are two buildings – that I mentioned earlier resembling gingerbread houses hahaha… The house with lower tower is Casa del Guarda (some sort of museum) and the house with the taller tower and the cross on top is Pavelló de Recepcio i Llibreria-botiga (reception and shop). 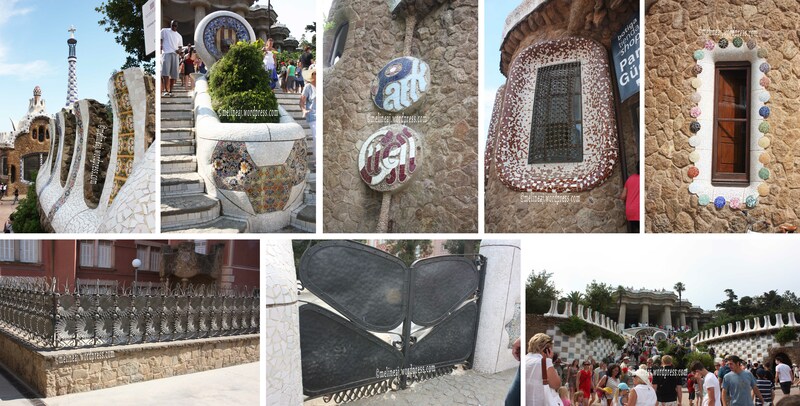 When we exited the gate on Carrer d’Olot, we saw ceramic mosaic “Park Guell” at the front wall. Nearby, there was a small gate resembling the mask in Casa Battlo. These little details are the ones that attract me the most to the work of Gaudi. 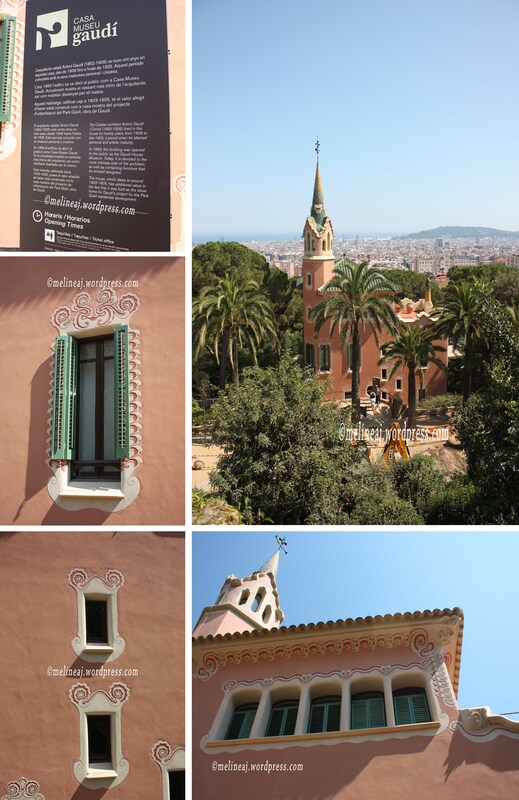 Every little thing was planned into the T. I was sad leaving Parc Guell… If I was living in Barcelona, I would gladly go there everyday – or every week at least! Right outside the front gate on Carrer d’Olot, there’s direction sign to the nearest metro station. You can walk 1.2 km or take bus #116 to Lesseps. Since it was a down hill road, we decided to walk along Carrer de Larrard. 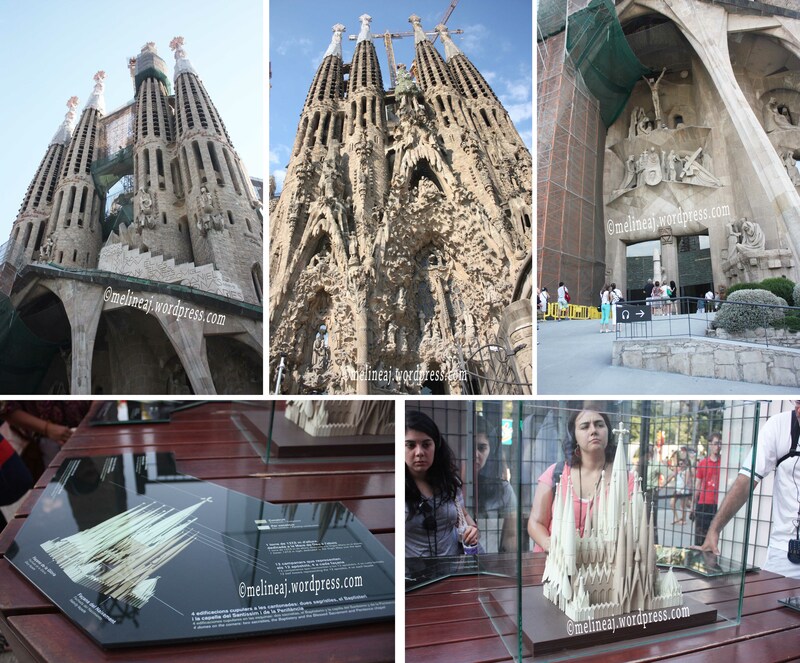 We saw a lot of souvenir shops and also Gaudí Experiencia. Inside Gaudi Experiencia, you can watch a 4D movie of Gaudi and his work but the ticket was pretty expensive, so we only took picture around and played the interactive games there. As we reached Travessera de Dalt, we took bus #92 to go to Lesseps metro station. From Parc Guell, we went to Camp Nou that is the home of FC Barcelona (stopped at Palau Reial metro). Neither me nor my hubby was the soccer fan but since Barça is a famous team, we just had to visit for once. The stadium was at the far end of Carrer de Martí i Franquès and located near Barcelona University. It wasn’t soccer season when we were there, so it was quiet. There is a tour for the stadium that costs €23. We passed on the tour and just walked around stadium for free hehehe… There is the official shop for FC Barcelona merchandise selling the jerseys (the baby jersey was cute! ), soccer ball, scarfs, and even the grass when FC Barca won the championship! Yeah, right?! It must be the most expensive piece of grass in the world! After we finished walking around the stadium, we walked back to Palau Reial metro. When we were about to go inside the station, we saw a tram passing by, so we took a tram to Maria Christina metro station when we stumbled upon El Corte Inglés Mall. We browsed this department store and bought some foods at the supermarket at the lower level. Since it was our last night at Barcelona, I forced my hubby to find a good restaurant that served paella. Originally, I wanted to dine at 7 Portes, the famous oldest restaurant in Barcelona. However, my hubby didn’t want to spend too much money on food since we already had ‘expensive’ lunch at Alkimia. So, we went to Barcelonetta area near Port Vell and looked for credible restaurants (not the touristy one with expensive price and bad food). However, the night was getting late and I was getting grumpier, so we dropped by at Marina’s and ordered a plate of paella. My hubby asked the server that about no seating charge and the server reluctantly assured us that there was no seating fee. Maybe for this annoying reason, our paella came 30 minutes after we ordered it… Anyhow, the paella was just okay – a bit too salty for my taste. Port Vell at night & a good plate of Paella! 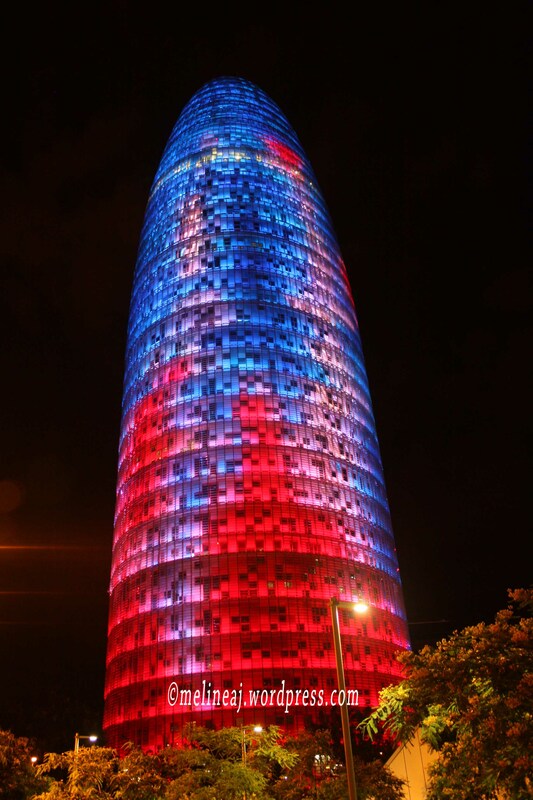 Our last trip of the night was going to Torre Agbar to take picture of the lit up bullet-shaped building. As we researched before, we knew that the metro stops running at midnight. And it was pretty close to midnight! So, once we got off at Glòries metro station, we rushed to take couple snaps and immediately hopped back into the metro to go back to the hotel. Now, thinking about it… I really wonder why we were so enthusiastic to go to this tower hahaha… At the end of the day, it was just a freaking tower! LOL….